“We’re no good at this,” John Paton says, sitting in a midtown Manhattan conference room on a gray, rainy spring day. “We” is the news business, and “this” is designing a viable future for it. “We have to figure it out.” He leans forward in his chair and adjusts his blue Hermès tie. “If this business model’s not fixed, the amount of American daily newspapers that won’t be here in five years will stagger you. They won’t make it.” The reporters and editors at Journal Register Company—a chain of eighteen daily newspapers and 176 non-daily newspapers, magazines, and websites in small markets throughout the Midwest and Northeast—should know. Paton took over as CEO of the company in February 2010 when the previously public company emerged out of bankruptcy as a private one. Since then, Paton has engineered a radical makeover of JRC’s previous image as an old-fashioned, bottom-of-the-barrel corporate chain. He’s attracted industry attention for hiring digital big-thinkers like Columbia University’s Emily Bell, CUNY’s Jeff Jarvis, and NYU’s Jay Rosen to his advisory board. He’s stressed a culture of transparency, community engagement, slashing costs without any layoffs in editorial or sales, and, above all, an upending of the daily news production process that he says is a byproduct of a print schedule that is irrelevant by now. “Digital first, print last” is the new JRC motto—that’s the order in which readers want the news, and so that should be the order in which outlets publish it. 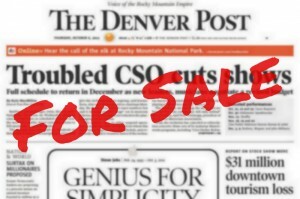 Paton hopes this culture change won’t just revitalize newspapers’ relationships with their readers; it’s his bet to push digital income high enough to replace the print revenue that he says will inevitably disappear.